If there’s one neighbourhood that is the “Hollywood’ of Toronto, it would have to be Riverdale. The area first became popular in the early 80s through “The Degrassi” series. The hit Canadian TV show was filmed here, and is named after the south Riverdale street of the same name. The neighbourhood is known for its vibrant arts community. Coffee shops featuring the artwork of local painters are no rarity. And Riverdale’s thriving version of Chinatown is your best bet if you want to avoid the hectic one along Spadina! Avonlea Renovations is no stranger to Riverdale. Our team is in and out of the area all year round – beautifying the neighbourhood one home at a time! 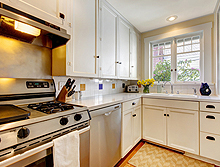 We’re known in the industry for our successful kitchen and bathroom renovations. But that’s not all we’re good for. Our repertoire also includes plumbing services and electrical contracting.